Double rifles--collecting, shooting, hunting, etc.--is great fun but don't forget to amass the treasured accessories that make owning a double rifle complete. These can be case accessories for cleaning and disassembly, original ammunition, and reloading items. 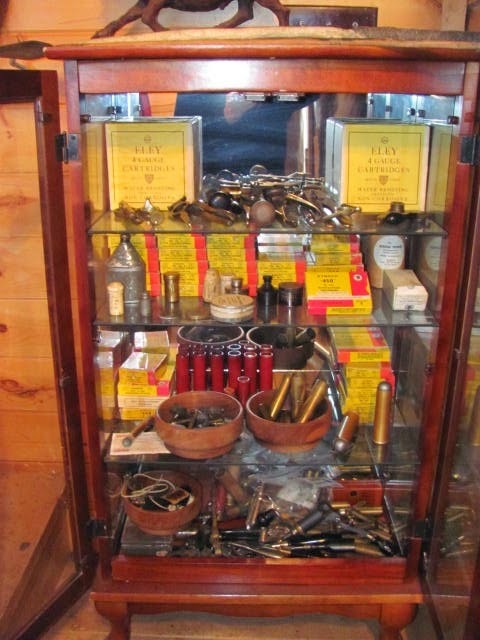 In the cabinet below are some of my items including original 4-bore ammo and boxes, Kynoch nitro express boxes, case accessories, and many reloading tools to include bullet moulds, decappers, cartridge extractors, Berdan depriming tools, sizers, bullet seaters (fixers), etc..